Who is your ‘other wing’? Perhaps several people, over the course of your life, have shared their wing with you so that you can both fly. 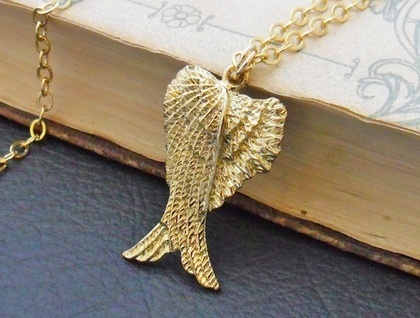 Two angel wings, one laid gently over the other, are depicted on this necklace. 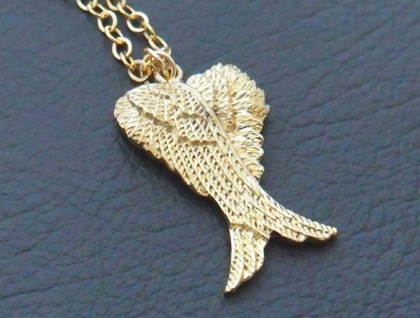 They are made of gold coloured metal, and are suspended on a Hamilton gold-filled chain. 'Hamilton gold' is actually brass with gold added to it, giving the rich look of gold at a lower cost. ‘Gold-filled’ – also called ‘rolled gold’ – items have a thick layer of gold bonded over a base metal. This layer is much thicker than gold plate, and accordingly lasts longer. It often has a richer shine to it than gold plate does. 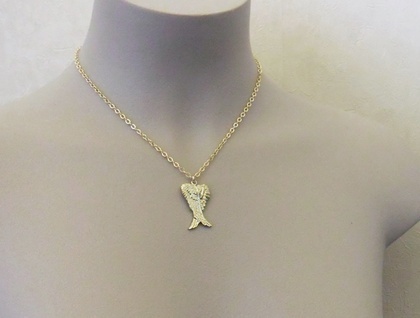 The little connecting rings are also gold-filled, and – in keeping with the theme of this design – the pendant hangs from two of these rings interlocked. The necklace is finished with a high quality, gold-plated clasp with a protective coating to preserve its finish from the wear of being clasped and unclasped over many years. 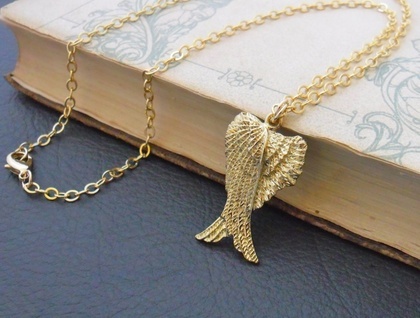 The 'Blessed Wings' necklace measures 44.5cm, including the lobster-claw clasp, while the wings pendant measures 32mm lengthwise, including the baile (the little hanging loop at the top), and 19mm across at its widest point.